The Model 2158 offers one of the most efficient, reliable, and cost effective solutions for connecting peered 10/100Base-T Ethernet LANs; reaching remote PCs and equipment; or delivering last-mile ISP services—all at 12.5 Mbps! The Model 2158’s compact size and connection options make installation easy. The 10/100Base-T Ethernet port is equipped with a shielded RJ-45 jack for connection to an Ethernet hub/switch, PC, or network-enabled device. The CopperLink port is equipped with an RJ-45 jack (optional terminal block is also available) for easy connection to the CopperLink Extenders. For convenient installation, the Model 2158 auto-senses and configures for 10Base-T or 100Base-T—as well as full or half-duplex—operation. The CopperLink Ethernet Extender, providing high speed Ethernet extension at 12.5 Mbps, is the ideal product for educational facilities, office buildings, multi-dwelling units, industrial complexes, government agencies, and military installations. 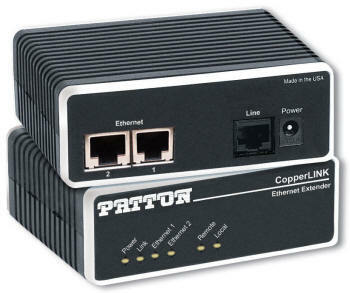 If you want to take your network connections farther and faster over existing copper, Patton’s CopperLink Ethernet Extenders are the perfect choice. Used in pairs, the Model 2158 establishes a high speed 12.5 Mbps communications link inter-connecting two geographically separated LANs. Operation is simple: packets destined for the remote LAN are sent transparently, at full line rate, to the peered LAN. Patton’s CopperLink Ethernet Extenders are a clearly superior and cost-effective alternative to expensive fiber and media converters, or LAN-grade cable and repeaters.